Jesus Cap spit up 15 hairballs before being resurrected. do you think jesus cat walked on water? i would imagine he’d avoid it entirely. 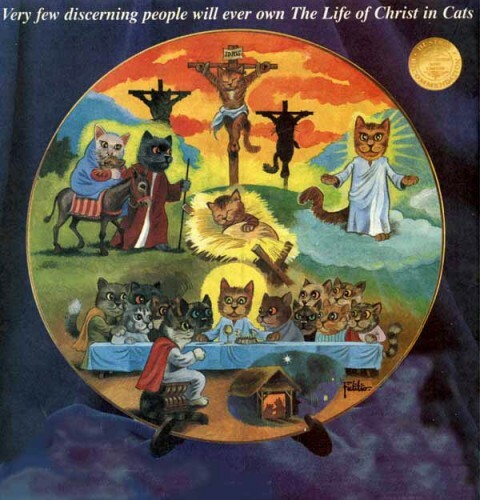 and when jesus cat wandered through the desert, did he poop in it and bury it slighty? If there was a Lolcat version I’d be down with that. coming soon from Whatever Tard-Tastic Company Makes These Commemorative Plates: Gandhi the Goat! Buddha Bear! and, by popular demand, Zeus the Zap-Happy Zebrafish! This plate was a spoof advert, run in the British adult humour magazine ‘Viz’. They also did an Elvis/Tutenkhamoun clock, and more recently a gravy fountain.